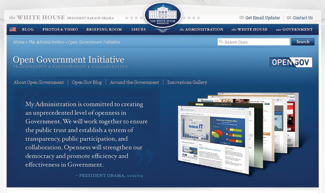 The Obama Administration’s Open Government Directive raised to prominence the principles of transparency, participation, and collaboration as “the cornerstone of an open government.” What lies at the heart of the open government vision is broader access to government data and creating new opportunity for citizens to contribute expertise and perspectives to government decision making. What is not yet clear is what types of value can be delivered and to whom through transparency, participation, and collaboration focused initiatives. While these three open government principles resonate in familiar and positive ways, it is not obvious how government agencies can best create new systems and services organized around them and ultimately deliver desired and measurable benefits to government and non-government stakeholders. 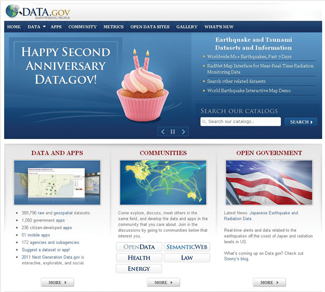 Data.gov is an example of a new system that was created with the principles of transparency and citizen engagement in mind. Hundreds of thousands of data streams were uploaded with the goal of enabling new opportunities for public use of this information. Inherently, most agree the act of creating data.gov produces value. But even if one assumes that the data is both usable and of high quality, which cannot be taken for granted, does the act of making greater amounts of government data available to the public by itself equate to greater transparency? How can the benefit of such an investment be understood and measured? Equally, asking questions about the nature and extent of value created through engagement initiatives is critical to understanding what works and what doesn’t and to using those lessons going forward in future efforts. Does more involvement result in better decisions? Or is it something about the nature of the involvement that matters most? To what extent does the design of the engagement interface influence the quality of the participation? These questions and many others like them have not yet been directly confronted. Unfortunately, many open government efforts are taking place in contexts that currently lack the conceptual frameworks and the performance benchmarks for evaluating their success. To begin to fill the gap in the ability of open government innovators to measure the impact of their efforts, CTG has developed an approach to address critical questions of public value. In our approach, transparency, participation, and collaboration are best viewed as instrumental to the accomplishment of democracy in that they enable citizens to perform their various roles as citizens. That is, transparency is not an end citizens pursue for its own sake. Citizens may desire their government to be transparent, but that is largely because something else is at stake: information and actions must be transparent so that citizens can scrutinize and assess the concrete outcomes of government action. Metrics that merely quantify how many datasets are available or how frequently opportunities to participate or collaborate are available, while useful for some purposes, cannot be taken as unequivocal indicators that open government efforts have created public value. Similarly, participation for the mere sake of participating is an empty and alienating exercise; instead, citizens participate in order to produce government action that responds to and reflects their input in meaningful ways. Public value, in the most general sense, focuses attention on the collective and societal interests that are served by particular institutional arrangements and actions of government. A public value framework can help to determine the value of government activities and do so from multiple stakeholder perspectives, not just a generalized, and thus ambiguous, citizen viewpoint. Much of the discussion around open government initiatives has been geared towards the broad all-inclusive category of citizens. By treating and analyzing such a diverse population as one undifferentiated group, any analysis falls woefully short of understanding the value of specific government actions. Instead, each government action needs to be treated as potentially presenting value to multiple and diverse stakeholders from both inside and outside the organization. To be most useful, the analysis of public value must center on particular stakeholder groups and their interests, not the citizen in a broad sense. The distribution of value across multiple stakeholders will vary according to their particular interests and expectations for government. It will also vary in the benefits they receive from the same government action; some stakeholders may also suffer from an action. Therefore, considering public value as an aggregate indicator of government outcomes misses the variety of interests and possible benefits across many stakeholders. The basis of the public value rationale is the link between government action and the multiple types of public value that can accrue. Public value types distinguish between the intrinsic value of government as a societal asset and the substantive value of government actions and policies that deliver specific benefits directly to individuals, groups, or organizations. Public value can be described in terms of seven general types of value that capture the range of possible results of government actions. Economic – impacts on current or future income, asset values, liabilities, entitlements, or other aspects of wealth or risks to any of the above. Political – impacts on a person’s or group’s influence on government actions or policy, on their role in political affairs, influence in political parties, or prospects for public office. Social – impacts on family or community relationships, social mobility, status, and identity. Strategic – impacts on a person’s or group’s economic or political advantage or opportunities, goals, and resources for innovation or planning. Quality of Life – impacts on individual and household health, security, satisfaction, and general well-being. Ideological – impacts on beliefs, moral, or ethical commitments, alignment of government actions or policies or social outcomes with beliefs, moral, or ethical positions. Stewardship – impacts on the public’s view of government officials as faithful stewards or guardians of the value of the government in terms of public trust, integrity, and legitimacy. Of these types, the first four are impacts related to the substantive private interests of individuals or groups. The remaining three types are related to intrinsic or societal and democratic outcomes. The public value of stewardship results from greater integrity, responsiveness, and legitimacy of government, leading to increased trust and satisfaction with the government overall. Ideological public value aligns government action with moral and ethical preferences or beliefs. Efficiency – obtaining increased outputs or goal attainment with the same resources, or obtaining the same outputs or goals with lower resource consumption. Effectiveness – increasing the quality of the desired outcome. Intrinsic enhancements – changing the environment or circumstances of a stakeholder in ways that are valued for their own sake. Transparency – access to information about the actions of government officials or operation of government programs that enhances accountability or influence on government. Participation – frequency and intensity of direct involvement in decision making about or operation of government programs or in selection of or actions of officials. Collaboration – frequency or duration of activities in which more than one set of stakeholders share responsibility or authority for decisions about operation, policies, or actions of government. Connecting a value type with a value generating mechanism makes clear how a government program results in one or more public values. For example, an IT investment in putting license application and renewals online may increase efficiency or effectiveness and yield strategic or financial public value for stakeholders that use such licenses. Transparent, participative, or collaborative actions taken by government may have the effect of enabling a citizen to derive substantive financial, social, political or strategic values and/or intrinsic value related to government itself. For example, when provided with environmental information (with transparency as the enabling value generating mechanism), a citizen may derive several different types of value. In this case, a citizen who acquires information about a toxic chemical release in his neighborhood may derive social benefits for his/her family and the community, but may also gain greater trust in the stewardship of a government agency that provides such information. But conversely, it is also possible that some stakeholders will derive negative public value from this release of information. The same citizen who learns of a toxic chemical release may sue the business allegedly responsible, resulting in negative public value for that business stakeholder. It is also possible that a group of internal governmental stakeholders may accrue positive political and strategic value by releasing the information because it meets an open government requirement; while another set of internal stakeholders may see that as negative political impact. Therefore, determining the value of any government action requires the systematic analysis of multiple stakeholder perspectives so that both positive and negative impacts are identified and understood. The information generated through this careful analysis enables more informed decisions to be made about open government initiatives. Open Government: What's at Stake? Transparency. Information and actions must be transparent so that citizens can scrutinize and assess the concrete outcomes of government action. Participation. Citizens must see that participation will produce government action that responds to and reflects their input. Collaboration. Collaboration only makes sense where participants can contribute useful expertise and experience, and where substantive decisions are under consideration. A public value analysis requires that an agency link its open government initiatives to its mission and priorities. The open government principles of transparency, participation, and collaboration are best viewed as strategies that government takes to accomplish organizational objectives (which should already be rooted in public values), that provide the opportunity to achieve greater or additional value through incorporating these democratic practices. More information, participation, or collaboration may enable better decisions that provide stakeholders with financial, social or strategic values while also enabling them to achieve the stewardship value of increased trust in the responsiveness of government. Government leaders may benefit from this approach by using it to plan, design, and assess open government initiatives. The selection and design of open government initiatives can be enhanced by a clear understanding of who is served by a particular initiative, by specifying what values an initiative seeks to create, and by understanding the value generating actions that are required to achieve benefit. This is a recipe for clear-minded planning and design that can improve the progress of open government. Planners can conduct their analyses by initiative, asking what stakeholders and values are targeted by initiatives in their portfolios, insuring that initiatives each have a discernible audience and specific outcomes. They can also analyze their portfolios by stakeholder, asking which initiatives serve which stakeholder groups and in what ways each will derive value across the full portfolio. Government leaders may also benefit from using this approach to evaluate their open government initiatives, as they, rather than the public at large, are better situated to evaluate a specific initiative. Agencies should be cautious in their use of metrics that report on events or incidents rather than outcomes. Metrics that report on numbers of datasets available, numbers of downloads, participation opportunities, and numbers of discussion posts, for example, are useful to report on the level of activity of both the government and citizens, but they do not give insight into the expected related benefits. The Open Government Portfolio Public Value Assessment Tool (PVAT) offers government leaders an approach to make more informed decisions about their portfolio of open government initiatives. The tool provides a structured way to assess the public value of an initiative so that an agency can review the expected public value across their entire portfolio of open government initiatives. The information generated from using this tool can then support decisions about the mix of initiatives in a portfolio and how to adjust the mix to enhance the agency’s public value. The underlying research for this tool was funded by an Early Action Exploratory Research Grant (EAGER) from the U.S. National Science Foundation. The tool’s conceptual design was developed and tested in cooperation with the U.S. General Services Administration (GSA), several federal, state and local agency representatives, and scholars interested or involved in open government. Government agencies or ministries serve the public at large through their commitment to serving particular groups of people with specific needs and desires. A public value analysis requires a relatively complete inventory of stakeholders for a government agency or unit. Further research is needed about the nature of transparency, participation, and collaboration as instrumental concepts themselves, since they are so easily misunderstood. The open government principles can be relatively easily operationalized. However, doing so without reference to value carries the risk that such actions will be empty scaffolding. Transparency, for example, will not be achieved through the mere downloading of data sets. The data sets must consist of reliable and valid data, the data must be useful, and, most crucially, they must enable citizens to do something they find valuable and important. If not, transparency is just another empty promise, and will contribute to growing cynicism within the electorate. Similarly, participation and collaboration must be meaningful and directed toward goals that are carefully defined and acknowledged by ample government feedback. Further, the citizen input they generate must be represented in outcomes that are visible to stakeholders in the decisions and the value produced. . Actions to promote transparency, participation, and collaboration may initially take more time and resources. However, they bear the promise of ultimately improving policy performance by creating shared understandings of current performance and generating pressure to improve, increasing the pool of applicable ideas, tapping into new sources of expertise, and building civic capacity. All these may ultimately turn out to be the key to concrete improvements in policy outcomes and the quality of public services. Achieving such outcomes will inevitably require changes in the structure and organization of government. Despite the new and innovative capabilities that new technologies introduce, innovations that focus on technology alone all too often reproduce existing rules, routines, norms, and power relations. The promise of open government is to provide a source of pressure that counteracts these tendencies. This promise may be fulfilled provided that open government changes the nature of relationships between stakeholders and government. These changes can produce innovative forms of organizations that enable groups to link across organizational boundaries and functions. The creation of public value may be the best possible argument for stimulating and justifying such structural changes.